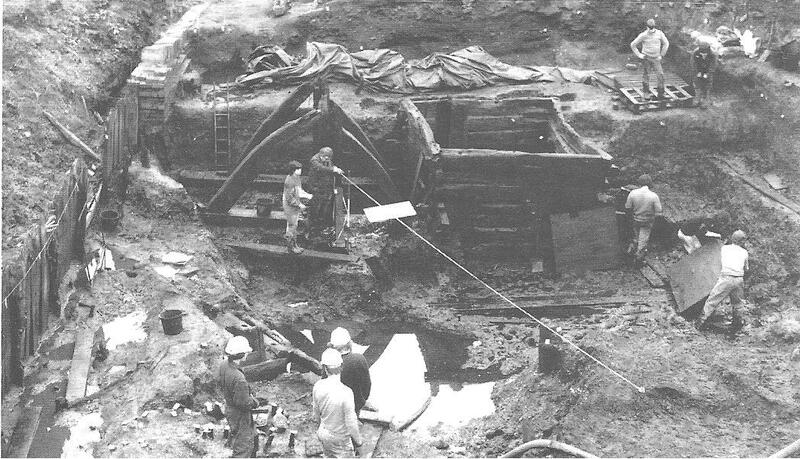 In 1970 the foundation of The Archaeological Research Centre (ARC) was formed at the National Maritime Museum to help cope with waterlogged remains of a wooden boat, a trading vessel dated to the 9th/10th century AD from the Graveney Marches in Kent. At that time there were no facilities in the UK,for the conservation of such a volume of waterlogged wood. 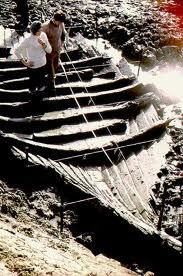 The Anglo Saxon Graveney Boat. Wood and other organic materials can be preserved in constantly wet terrestrial sites,or under the sea,especially when isolated by silts and sands. The preservation of organic materials is a complex process but with the development of anaerobic( i.e. without oxygen) conditions the conservation process brings wood and other wet materials to a dry and stable condition with the minimum of distortion by means of treatments that do not alter the internal structure or that may impede any future examination or re-conservation. The largest of these purpose-built tanks in the ARC is 8m in length so substantial timbers can be dealt with. After the timber is loaded the tank is filled with water and heated to the operational temperature of 60 deg C which is maintained throughout the treatment. PEG is added in equal amounts daily, until the concentration is considered high enough to ensure support of the timbers when they are cooled. Alternatively, PEG can be used at room temperatures for the conservation of smaller objects made from more porous species of wood. 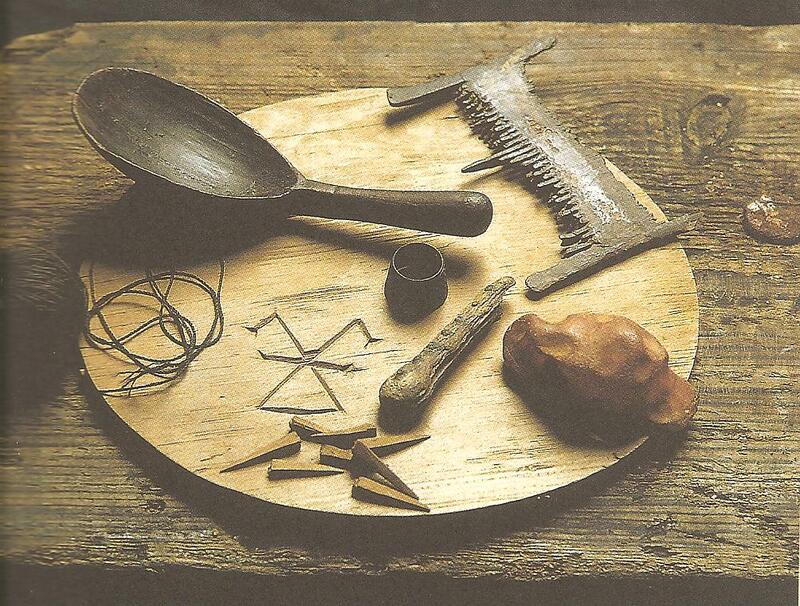 I remember when working with the Worcester Archaeology at the Droitwich excavation many pieces from a Roman barrel with staves of silver fir and split oak hoops being treated in this way. When dealing with small wooden objects the range of treatment available broadens, for any operational hazards involved are more easily contained. Such objects can be dehydrated by exchanging the contained water for alchohols or other organic solvents which have low surface tension and higher volatility than water, can be allowed to evaporate with minimal disruption to the wood structure. Freeze drying achieves dehydration but by different means. Wood treated in this way is more normal in appearance. 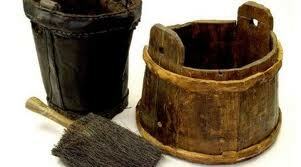 Wood and Leather Buckets from The Mary Rose. CONSERVATION OF OTHER MATERIALS FROM WET SITES. Concretions may enclose an iron object, or the cavity resulting from its dissolution ,or an assembly of objects fused together .Maybe only the surface of an object may be obscured or disfigured by concretions or marine organisms. These are removed preferably by mechanical means using scalpels, vibrating needles or other hand held tools. However the chemical cleaning of organic materials may well be necessary. This is not Iron but a pot showing concretions which need to be removed. 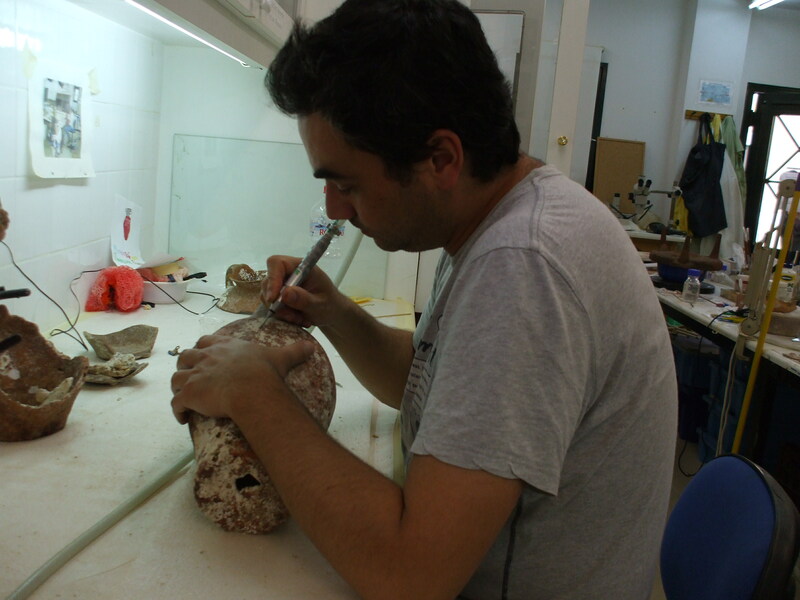 The concretions being removed using a vibrating needle. Its possible that wood,leather and textiles may be contaminated by iron or some other corrosion products filling the pores or internal structure. After the cleaning there follows often and extended period of washing to remove and residues of chemical treatment and soluble salts that may be present. Iron is very sensitive to the presence of such salts and requires more than simple washing and there are a number of chemical and electrlytic treatmentd which may be required before the washing process. Most materials are dried through dehydration with an organic solvent. Broken objects can now be reassembled and joined with a suitable adhesive,preferably one that is reversible. Fragile objects may require consolidation to ensure their durability and this may occur before or after any necessary reassembly. Objects which are substantial but sensitive to atmospheric moisture also require protection. Iron is commonly impregnated with a micro-crystalline wax, whereas other metals such as copper alloys are coated with laquers which contain inhibitors to prevent further corrosion. When all conservation work has been achieved,depending on the material involved, then has to be stored in a controlled temperature as the object concerned will react to changes in temperature,humidity,light or contaminations in the atmosphere. Iron and other metals may corrode in constantly high humidities which may also support mould growth,textiles and painted surfaces can fade when exposed to high light levels. 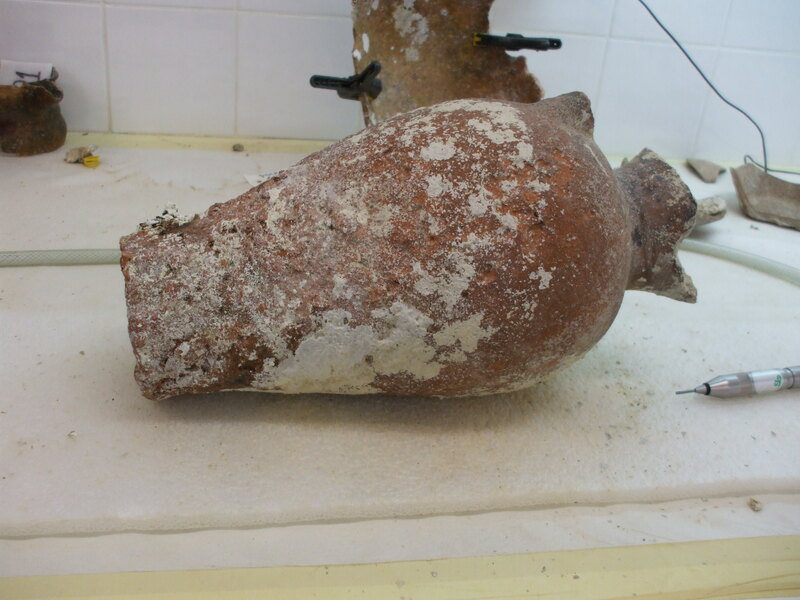 We can see why Museums have to ensure that an object is located in a controlled and appropriate environment whether in storage or on display is one of the most important factors in its long term survival. The Upwich Brine Pit Droitwich. Excavation of the Great Upwich Brine Pit Droitwich. 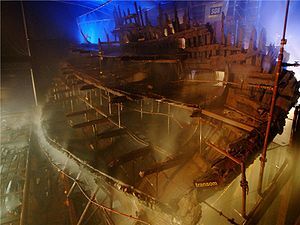 Remnents of the Mary Rose before Conservation. 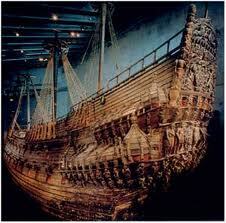 The Vasa Vessel as it appears today after conservation treatment. It is on a cold winters night that there is nothing like climbing into a warm cosy bed previously heated by today’s modern centraly heated houses,or electric blanket, or even hot water bottles. But not so for our ancestors. Not only were there. no adequate windows in the medieval residences of England,the strong winds created draughts strong enough to blow out candles while being carried from room to room.The first sign of the approaching winter weather when frosts did not help keep beds from becoming damp and severely cold, was daunting to say the least for our ancestors. However, by the time of Elizabeth l , the problem had been solved and the warming pan was heartily welcomed. 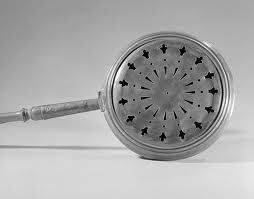 The metal pan was hinged and could be filled with glowing embers or coals, the pan when placed between the sheets could be moved around the bed by the handle attached to the pan. We know from records that Queen Elizabeth’s warmer was made of gold,decorated with small diamonds and rubies. Unfortunately there are no pictures for us to see but sounds exquisite and priceless if it ever came up for auction. A late 17th to early 18th Century Copper Warming pan.Note the beautiful patina aquired through centuries of polishing. For todays collectors the problem is there are “as always” plenty of reproductions around and have a convincingly “aged ” look about them so it can be a little difficult to tell the original from the fake…But don’t despair as there are give-away things to look for. 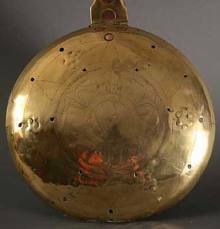 Firstly knowing the history of shape and style in warming pans and the second is knowing your metals.The earliest examples date from the Mid 16th to around 17th century. solid cast and turned iron or steel handles,the lids of solid brass with deep pans. I feel sorry for the poor servants who had to carry them. Live coals were used at this stage and because of this holes had to be pierced into the lids of the pans so that the coals did not go out when the lids were closed. The lids on these early pans are beautifully engraved and pierced by the metalworker sometimes working the coats-of-arms for a specific family for whom the pan was intended. 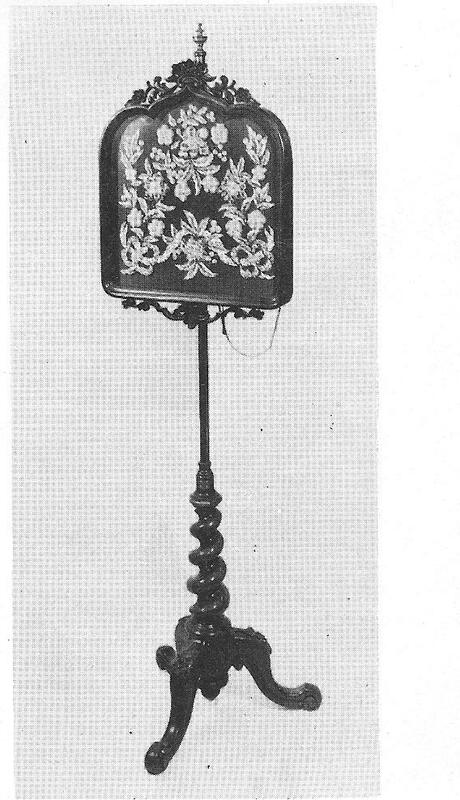 These elaborately designed bedwarmers were of course for the rich mans pocket. By around 1700 there were plenty of plain warming-pans on the market aimed at the less wealthy so could be bought quite cheaply for around three shillings. 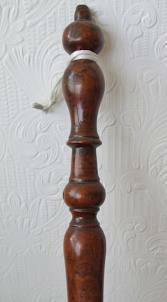 The earlier examples were too heavy with their solid wrought-and cast iron handles and by the 18th century wooden handles were introduced conveying expert turnery in beach,oak and other local woods. Technical advances had also improved the production of English copper which meant there was little danger of its cracking or faulting in use. Now that the new copper with its rich glowing finish,had swept into popularity decoration was minimum and as the pan was now to hold embers instead of live coals the lid could now be solid ,piercing was not necessary. It is these warming- pans that were most popular from the first quarter of the 18th century through to the mid 19th century and highly collectable.Over the years the copper appears to have mellowed to a rich glowing colour and the handles have that beautiful patina aquired through years of careful polishing. The earlier 18th century models are much heavier and the pan deeper,but from then on were much lighter also, because embers were being used instead of coals the pans became much shallower. 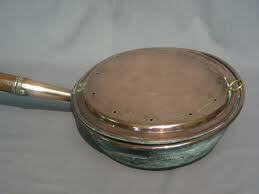 This warming pan displays the beautiful piercing decoration popular on the early copper warming pans. If you have a sharp eye for telling the difference between an old warming-pan and new, you may spot a bargain.Look for the colour differences between old and new…..Any piece of old copper has a much pinker,glowing tinge to it,and much smoother-looking finish than modern metal,and the wood no matter how well it may be stained,cannot achieve that rich deep sheen which comes from constant polishing through the centuries. But of course the most obvious clue to telling whether or not a warming- pan is original is the fact that,it was used to serve a purpose,therfore it will inevitably show signs of wear and tear. There are usually signs of small fractures around the hinge or on the shank where the metal pan is fixed to the handle. The handle itself will show a pattern of uneven shades where parts would be worn more than others through frequent use. And finaly is the metal thick enough to carry the embers safely ?.If the answer is no,then you have a reproduction. 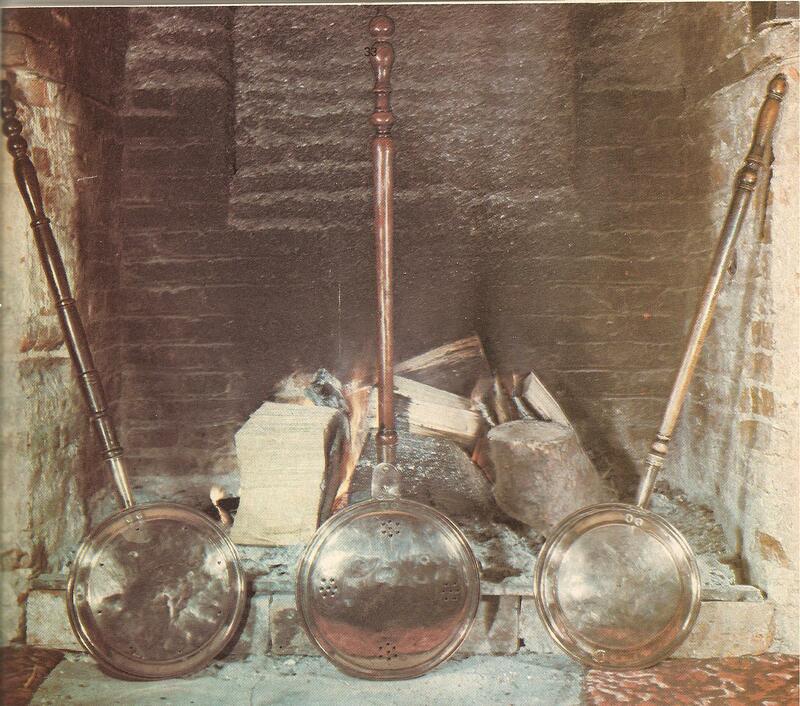 However there are some really nice reproduction warming-pans to be had. But for me, it would have to be the real thing. This is a Victorian Warming Pan Handle but you can see how the patina has built up during this much later period. The Beauty of Antique Beadwork. The beautiful blue turquoise or pottery beads in Iran and Syria,the colourful strings of Wampum changing hands among American Indians, the elegent seedpearls used to decorate the doublets of many Elizebethen courtiers- and the variety of materials which have fallen under the heading of beadwork is phenomenal. A string of beads told one of many things about its wearer.It could betray his superstitious nature- as he wore it as protection against evil spirits or enemies he might have. Earliest beadwork utilised bits of every day litter such as, Opalescent shells washed up on rocky beaches,pips or seeds from fruit,the bones of small animals all were useful as ornament. The Egyptians refined their beadwork collar material,producing fine,smooth small pellets of lapis lazuli,amythest,cornelian and gold for the best pieces,and perfecting a method for producing a type of pottery faience bead for everyday wear. The tiny glass bead we associate with most beadwork today originated with the Mycenaen Greeks and were first gilded,later plain They were strung onto necklaces interspersed with gold pendants and ornaments creating fringe-like droplets. The Romans and Etruscans both experimented with glass beads but later preferred strings of polished uncut gemstones. Many of the 19th century pincushions and smaller domestic articles found in antique shops today, include bead motifs such as, The Dove of Peace, The Oak Leaf and The English Rose were the product of commercial minded squaws on reservations and Indian settlements. 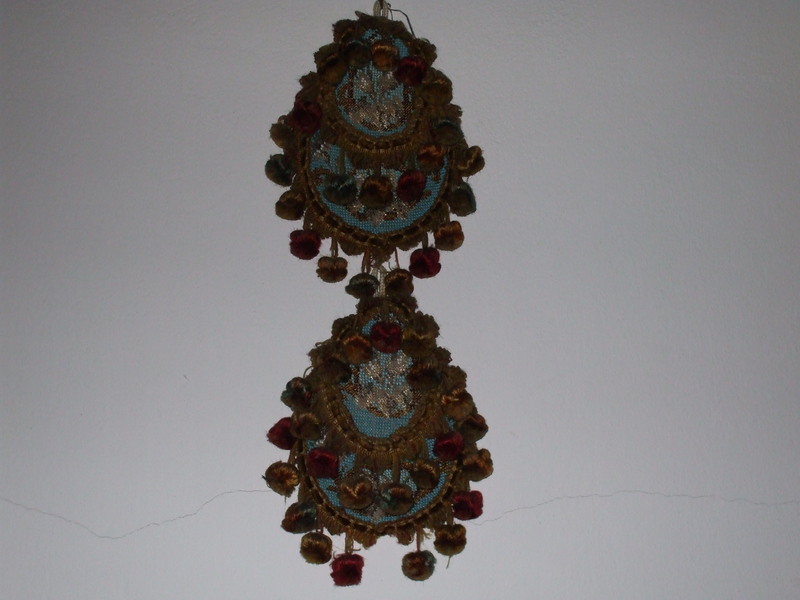 Many other articles include watch-cases, purses,pin-cushions, bell pulls,curtain sashes and hair tidies all made by outworkers and cottage industries.The gents love token-usually from a sailor or army man in the shape of an embroidered,bead-bedecked heart, became another popular item. Often the coloured beads picked out a regiments number or the skeleton of a ship in full sail. Long afternoons were spent by well-to-do ladies in their leasure time making table edgings and fringes,chair and footstool covers. The Victorian moral code was that “time should be well spent”. Later beadwork became more elaborate and smaller articles were being made that could be found about a lady’s person such as, bodkin holders,scissor sheilds and many other small items. The holders of quill pens also showed a flourish of beading-Queen Marie Antoinette is said to have had a liking for this pleasant touch.Purses and handbags were often made by stitching beads one by one into a canvas of net ground. Victorian beadwork pocket watch holders. 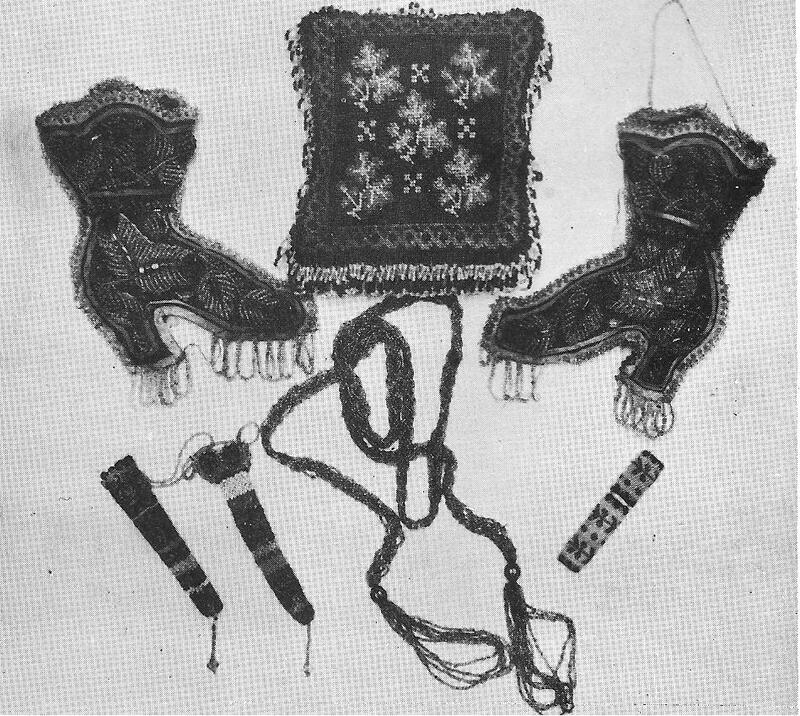 Collection of Victorian Beadwork.All C.1858 includes two ladies hair tidies bottom left and the tiny scissors case on the right is a particular delicate example of the craft. 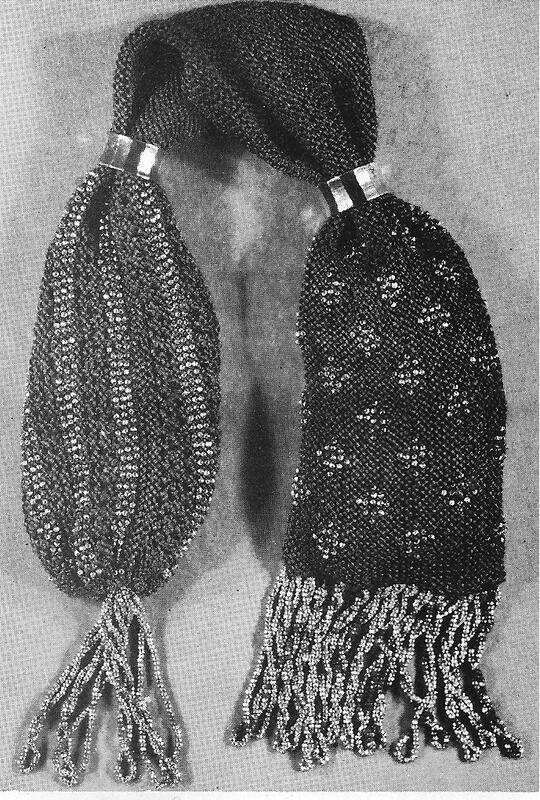 One of the earliest pieces of beadwork,the sovereign, or” misers purse” is one of the most difficult of beaded products to make.These long sausage or duffle-shaped coin bags were either crocheted or knitted,with the beads dropped in at planned intervals. The end piece or” garniture” was usually composed of beads and decorated both terminals,so that two fringe edges hung on either side of ones belt where the purse was designed to loop(see illustration) A slot was left in the side of the purse itself and two gilt rings narrowed the centre portion,so the aperature was closed and the coins allowed to slide to either of the fringed ends. A mind blowing excersize to say the least. A fine piece of Victorian needlework- beadwork firescreen. After 1865 the artisans began to diversify, beaded handscreens made to sheild delicate complextions from the heat of parlour fires,bell ropes,and pictures of beaded vases and flowers under glass,collars,cuffs and capes,chairbacks and sofa cushions,tea cosies, pin cushions,watch cases(a Victorian/Edwardian type mitton to keep timepieces warm at night) and even candlesticks, all glories in the glittery glamour of the new-found medium.The 1860’s brought the velvet dresses,shawls and parasols embroidered with jet as a result of mourning Prince Alberts demise.and used thereafter at funerals. Beaded slippers were another popular item and the Berlin woolwork was often enriched with beading. Beaded pieces in good condition are hard to find, but once found,they can be kept in a good condition with minimum effort. A piece should never be cleaned with a vacuum but may be washed in soapy water with a very soft brush. It should be laid out horizontally when drying and if put in storage should be packed flat if possible,it should never be folded since the threads will have become brittle with age. When I was in the antique trade in the 1970’s – 80’s, beadwork pieces were reasonably cheap. A Victorian pin cushion for instance would cost around three pounds where a tea cosy would be about fifteen pounds.Todays prices obviously much higher depending whether you manage to spot a bargain. Some of the most desirable pieces are those in the turquoise-blue beads,so they tend to be more expensive. But colour combinations and themes,from the subdued and tasteful to the garish exist to please every eye. And what teapot could feel prouder or pocket- watch( or in fact today’s wrist-watch) warmer,than in the cuddly confines of a handbeaded mitton made by, who knows? maybe one of your ancesters. 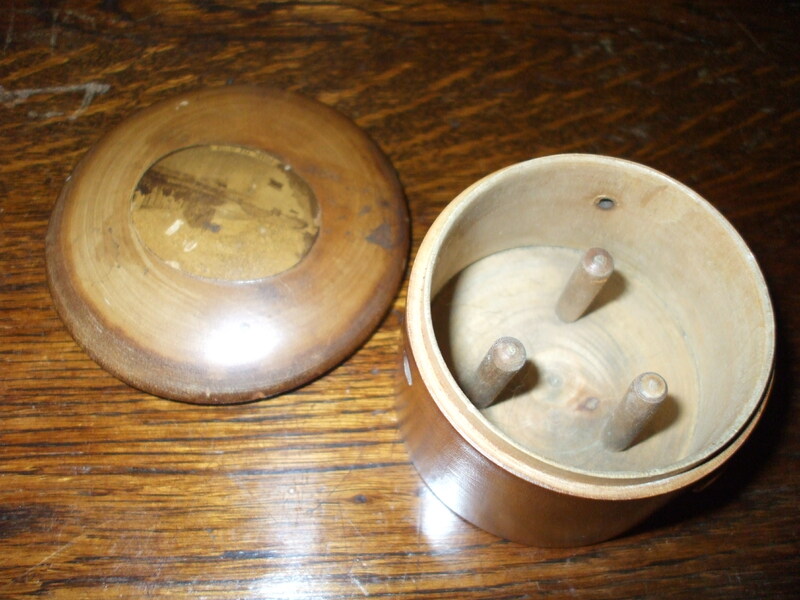 These lovely Victorian wooden boxes held beads.Pin cushion front of picture. 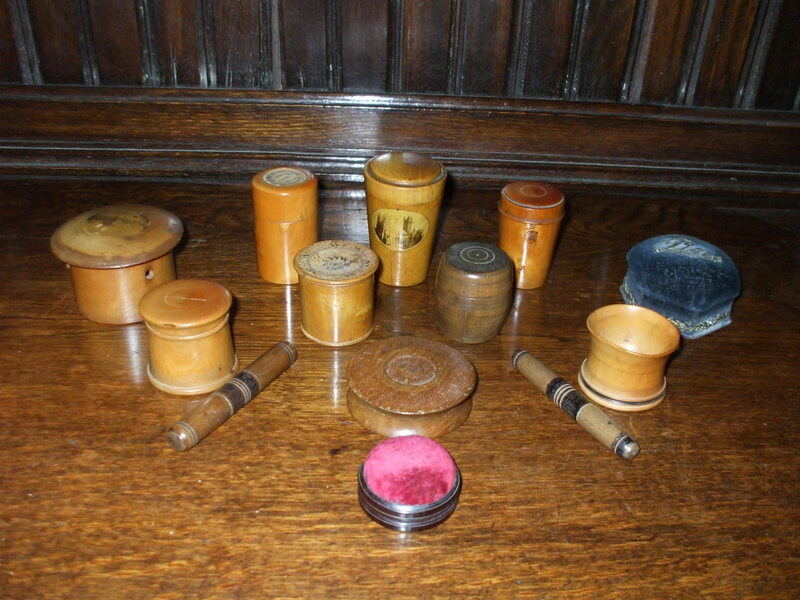 .Also two tube boxes front of picture held needles.Blue box back right, was for pins. the prongs and the cotton thread pulled through holes at the side. 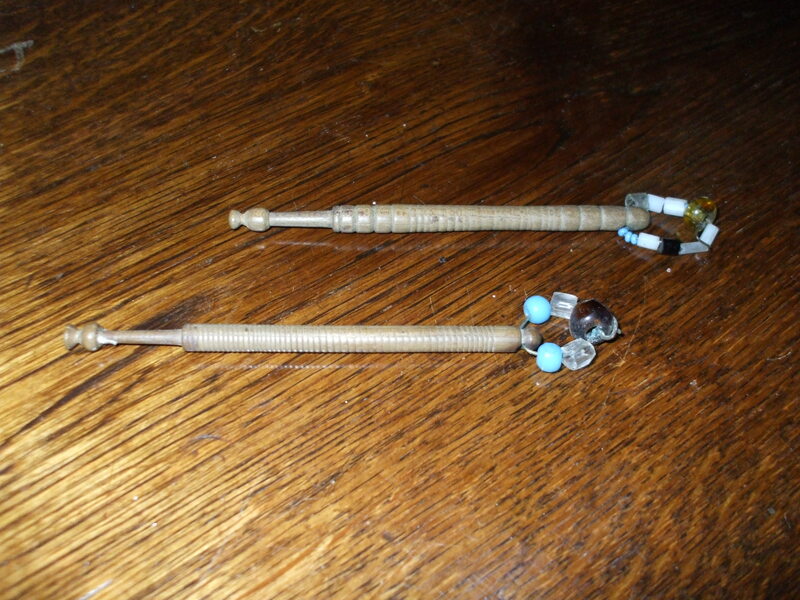 Two pretty little lace bobbins. Small items such as these are well worth collecting as they don’t take up too much storage room and should be reasonably priced for todays collector.